A flight of Scarlet Ibis (left) coming to roost at dusk is an impressive sight. In Trinidad, where this photo was taken, it has become a lucrative industry for small boats to take tourists to a favored roosting islet at dusk, where the customers sip rum punch and watch the show. And what a show it is! The Ibises and Spoonbills are easily recognized as a family with two distinctive shapes: the ibises are medium-to-large, long-legged birds with long decurved bills while the spoonbills are large, long-legged wading birds with bills modified to be spoon-shaped at the tip. These are often recognized as two subfamilies but, as there has been some hybridization between an ibis and a spoonbill in Eurasia, others think them too closely related to be formal subgroups (discussed in Matheu & del Hoyo 1992, who do consider them subfamilies). Seven ibises are essentially restricted to South America or nearby islands; Scarlet Ibis is among those. 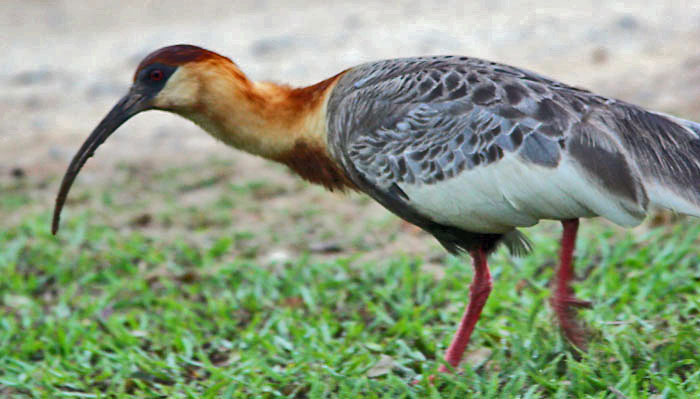 Buff-necked Ibis (below) is widespread in open savanna, small marshes, or rangeland. Other Neotropical ibis (e.g., Green Ibis Mesembrinibis cayennensis) are mostly forest birds. 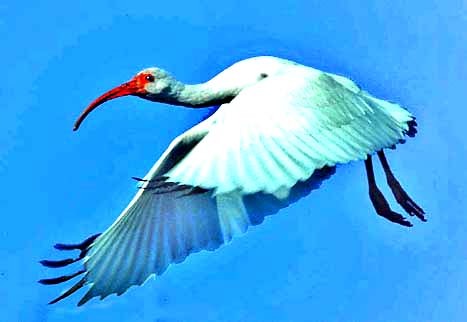 The family Threskiornithidae is cosmopolitan, and both ibises and spoonbills are found on every continent, except Antarctica. While most species are tropical, a fair number range into the temperate zone. They are generally considered waterbirds, and quite a few species — including Black-headed Ibis of Asia (right), wading deep in this shot from India — are generally associated with aquatic habitats: marshes, margins of lakes and rivers, flooded fields, or wet grasslands. But this group is not necessarily tied to these habitats; they are often found foraging in open fields. This pair of Sacred Ibis (below) in Africa is high-stepping through fields of flowers, far from any water. 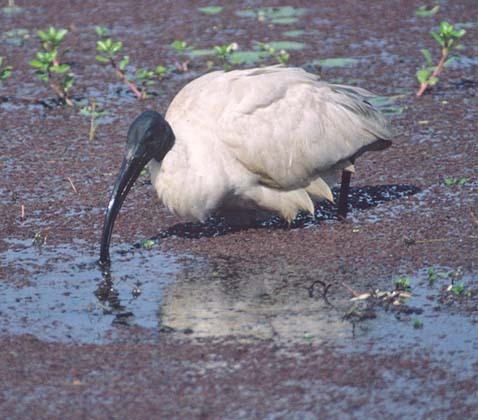 These two black-and-white species are part of a triad, with Australian Ibis Threskiornis molucca, whose taxonomy has been the subject of debate for years. They look very similar but their ranges do not overlap. Are they just one widespread species, or three species? Most now take the latter view. 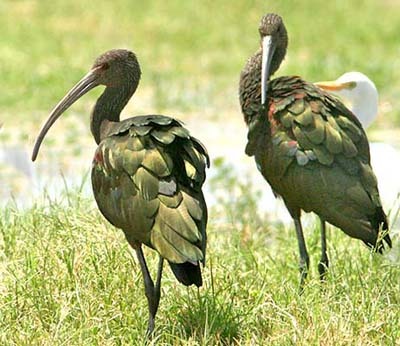 Both Glossy Ibis (right) and White-faced Ibis (below) have a wonderful oily sheen of metallic colors in their plumage. Glossy Ibis ranges across much of the globe while White-faced is limited to western parts of the New World. These two can be very difficult to separate in non-breeding condition, and bare part colors are the key. Glossy has recently been expanding its range in North America, and there are recent records from as far west as California. The six species of spoonbill are more restricted to aquatic habitats. These birds wade in shallow water with their uniquely modified bills, and grab prey they encounter while sweeping the bill side to side through the water. They eat aquatic insects, crustaceans, frogs, tadpoles, and in some species, quite a lot of fish. Roseate Spoonbill, which ranges from the southeastern United States to Brazil, has a gorgeous rosy-pink plumage (above). This species is easily seen along the Gulf coast of the U.S., and widely in Mexico, but is a major rarity to California. Unpredictable incursion years sometimes bring dozens to the Salton Sea. The other five spoonbills have an all-white plumage, but bill colors range from pale yellow to black. African Spoonbill (left) has a red face. Most species of ibises and spoonbills breed in dense colonies, often in association with other waterbirds, such as herons or cormorants. These colonies can be in trees, where large bulky nests are built, or on the ground on offshore islets. Colonies are typically near or over water. White Ibis (right) is one of those colonial nesters. The small forest-dwelling ibises, such as Olive Bostrychia olivacea and Spot-breasted B. rara Ibises in Africa, do not nest in colonies. Even the widespread Hadada Ibis B. hagedash in Africa breeds alone. Seven members of the Threskiornithidae are listed as globally threatened; two more are listed as near-threatened (Birdlife International 2000). One of these is Northern Bald Ibis, often called Waldrapp (left, in a fine shot by John Marchant) which has isolated populations in Morocco (the photo is from Morocco), Turkey, and Syria. The Moroccan population is mostly resident, although one did stray north to Spain in 2005. The Syrian population is migratory, with birds moving to Ethiopia in winter; it was down to just 13 birds in 2006 (Hirschfeld 2007). The Turkey population is heavily managed: they breed in a free-flying state for five months, but then are taken into captivity to prevent migration. Birds from all populations nest in colonies on rocky cliffs. The Southern Bald Ibis (above) is a resident of South Africa, Swaziland, and Lesotho. It lives on higher elevation short-grass plains, and breeds on undisturbed cliffs. Habitat loss, human settlement, and agricultural practices have impacted its numbers, which continue to decline. 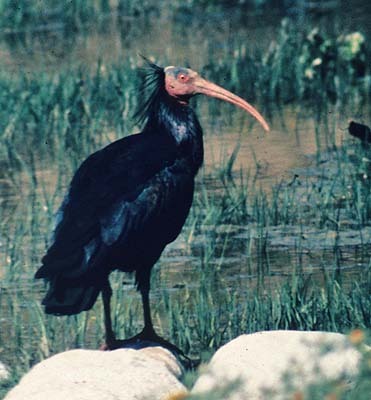 Several forest ibises are threatened. Some have very small ranges, such as Dwarf Ibis Bostrychia bocagei on Sao Tome. The White-winged Ibis, sometimes called Madagascar Crested Ibis (sketch, right), is endemic to Madagascar where it is rare and local in eastern rainforests. Back in 1992, when I visited that magical island, it was considered quite a coup to locate one, as we did near dusk at a small pond in the forest near Perinet. I was so impressed that I made a field sketch. Two forest ibises in southeast Asia are critically endangered: Giant Ibis Thaummatibis gigantea in southern Laos and northern Cambodia, and White-shouldered Ibis Pseudibis davisoni in Cambodia, Laos, and the Indonesian state of Kalimantan on Borneo. The latter has disappeared from prior ranges in China, Sarawak, and Vietnam. Populations of both species were estimated at less than 250 birds (Hirschfeld 2007). The situation seems somewhat better for the unique Crested Ibis (below), now restricted to Shaanxi province in central China. It had once ranged throughout the far east, including Japan. Its current colony is now managed for conservation, and even bird tours now visit there annually. I was able to see this one (below) on such a tour; others came to roost in the nearby village. 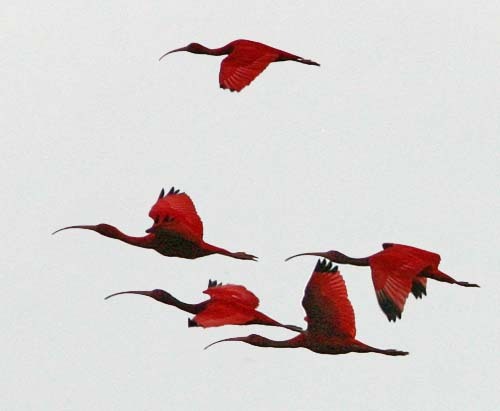 Photos: The evening flight of Scarlet Ibis Psophia crepitans was at Caroni Marsh, Trinidad, on 24 Dec 2006. The Buff-necked Ibis Theristicus caudatus was at Porto Joffre, Brazil, on 22 July 2010. The Black-headed Ibis Threskiornis melanocephalus was at Ranthambhore, India, in Mar 2001. The Sacred Ibis Threskiornis aethiopicus were at Nieuwoutville Wildflower Reserve, South Africa, on 6 July 2005. 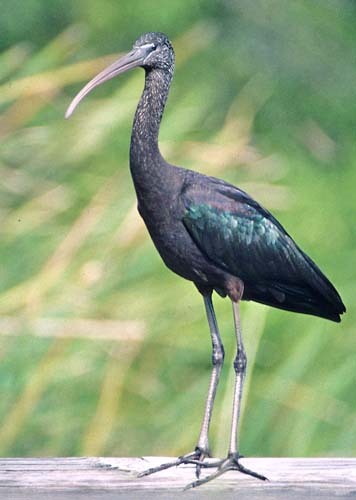 The Glossy Ibis Plegadis falcinellus was in Everglades Nat'l Park, Florida, in Jan 1999. The White-faced Ibis Plegadis chihi were in the Imperial Valley, California, on 3 Aug 2007. 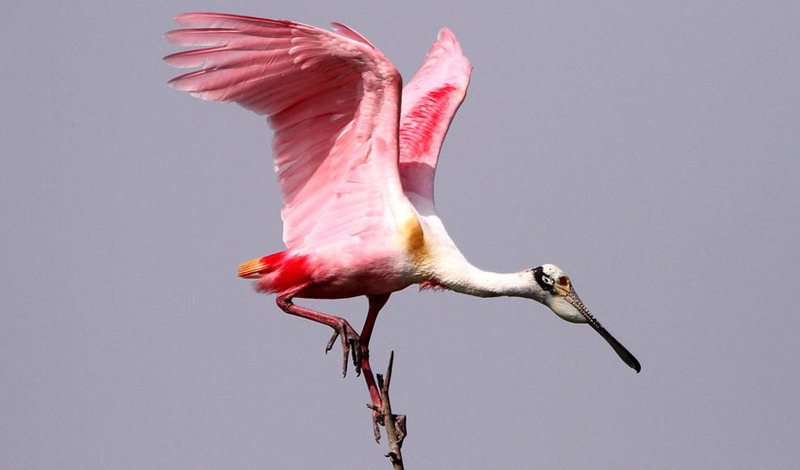 The Roseate Spoonbill Ajaia ajaja was at High Island, Texas, on 28 Apr 2014. 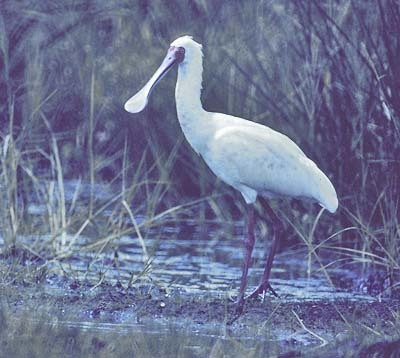 The African Spoonbill Platalea alba was at Lake Jipe, Kenya, in Nov 1981. The Southern Bald Ibis Geronticus calvus was near Wakkerstroom, South Africa, on 25 July 1996. John Marchant photographed the Northern Bald Ibis (Waldrapp) Geronticus eremita in Morocco on 4 Mar 1978. 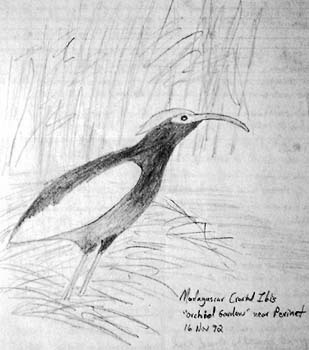 My sketch of White-winged Ibis Lophotibis cristata was made near Perinet, Madagascar, on 16 Nov 1992. The Crested Ibis Nipponia nippon was near Huanyang, Shaanxi, on 7 Nov 2010. All photos & sketch © Don Roberson, except for the Waldrapp © John Marchant, used with permission; all rights reserved. Bibliographic note: There is not a single "family book" per se, although the Threskiornithidae are often featured in book about waterbirds. A fine introduction to this family, with some good photos, is in Matheu & del Hoyo (1992). Hirschfeld, E., ed. 2007. Rare Birds Yearbook 2008. MagDig Media Ltd., Shropshire, U.K.
Matheu, E., and J. del Hoyo 1992. Family Threskiornithidae (Ibises & Spoonbills), pp. 472–507 in Handbook of the Birds of the World (del Hoyo, J., A. Elliott & J. Sargatal, eds). Vol. 1. Lynx Edicions, Barcelona, Spain.